Interleukin 8 receptor, alpha is a chemokine receptor. This name and the corresponding gene symbol IL8RA have been replaced by the HGNC approved name C-X-C motif chemokine receptor 1 and the approved symbol CXCR1. It has also been designated as CD181 (cluster of differentiation 181). The IUPHAR Committee on Receptor Nomenclature and Drug Classification use the HGNC recommended name, CXCR1. 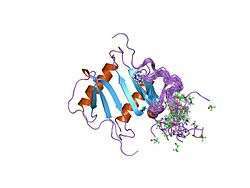 The protein encoded by this gene is a member of the G-protein-coupled receptor family. This protein is a receptor for interleukin 8 (IL8). It binds to IL8 with high affinity, and transduces the signal through a G-protein-activated second messenger system. Knockout studies in mice suggested that this protein inhibits embryonic oligodendrocyte precursor migration in developing spinal cord. This gene, IL8RB, a gene encoding another high affinity IL8 receptor, and IL8RBP, a pseudogene of IL8RB, form a gene cluster in a region mapped to chromosome 2q33-q36. Stimulation of CXCR1 in neutrophils by its primary ligand, Interleukin 8, leads to neutrophil chemotaxis and activation. Blocking CXCR1 (e.g., with repertaxin) inhibits some human breast cancer stem cells (in vitro and in mice). In malignant melanoma expression of CXCR1 at the cell surface is present, independent of the cancers stage. It is thought to have a role in the cell growth and angiogenesis required for tumour survival. In this way it has been identified as a potential therapeutic target. CXCR1 can be cleaved and inactivated by Neutrophil Derived Serine Proteases (NSPs), leading to neutrophil dysfunction and impaired bacterial killing in Cystic Fibrosis lung disease. Interleukin 8 receptor, alpha has been shown to interact with GNAI2. ↑ "Entrez Gene: IL8RA interleukin 8 receptor, alpha". ↑ Bergin DA, Reeves EP, Meleady P, Henry M, McElvaney OJ, Carroll TP, Condron C, Chotirmall SH, Clynes M, O'Neill SJ, McElvaney NG (December 2010). "α-1 Antitrypsin regulates human neutrophil chemotaxis induced by soluble immune complexes and IL-8". J. Clin. Invest. 120 (12): 4236–50. doi:10.1172/JCI41196. PMC 2993580 . PMID 21060150. ↑ Casilli F, Bianchini A, Gloaguen I, Biordi L, Alesse E, Festuccia C, Cavalieri B, Strippoli R, Cervellera MN, Di Bitondo R, Ferretti E, Mainiero F, Bizzarri C, Colotta F, Bertini R (February 2005). "Inhibition of interleukin-8 (CXCL8/IL-8) responses by repertaxin, a new inhibitor of the chemokine receptors CXCR1 and CXCR2". Biochem. Pharmacol. 69 (3): 385–94. doi:10.1016/j.bcp.2004.10.007. PMID 15652230. ↑ Ginestier C, Liu S, Diebel ME, Korkaya H, Luo M, Brown M, Wicinski J, Cabaud O, Charafe-Jauffret E, Birnbaum D, Guan JL, Dontu G, Wicha MS (February 2010). "CXCR1 blockade selectively targets human breast cancer stem cells in vitro and in xenografts". J. Clin. Invest. 120 (2): 485–97. doi:10.1172/JCI39397. PMC 2810075 . PMID 20051626. Lay summary – Genetic Engineering & Biotechnology News. ↑ Sharma, Bhawna; Singh, Seema; Varney, Michelle L; Singh, Rakesh K (2010-04-01). "Targeting CXCR1/CXCR2 receptor antagonism in malignant melanoma". Expert opinion on therapeutic targets. 14 (4): 435–442. doi:10.1517/14728221003652471. ISSN 1472-8222. PMC 4229031 . PMID 20230195. ↑ Hartl D, Latzin P, Hordijk P, Marcos V, Rudolph C, Woischnik M, Krauss-Etschmann S, Koller B, Reinhardt D, Roscher AA, Roos D, Griese M (December 2007). "Cleavage of CXCR1 on neutrophils disables bacterial killing in cystic fibrosis lung disease". Nat. Med. 13 (12): 1423–30. doi:10.1038/nm1690. PMID 18059279. ↑ Damaj BB, McColl SR, Neote K, Songqing N, Ogborn KT, Hébert CA, Naccache PH (October 1996). "Identification of G-protein binding sites of the human interleukin-8 receptors by functional mapping of the intracellular loops". FASEB J. 10 (12): 1426–34. PMID 8903513. ↑ Damaj BB, McColl SR, Mahana W, Crouch MF, Naccache PH (May 1996). "Physical association of Gi2alpha with interleukin-8 receptors". J. Biol. Chem. 271 (22): 12783–9. doi:10.1074/jbc.271.22.12783. PMID 8662698. "Chemokine Receptors: CXCR1". IUPHAR Database of Receptors and Ion Channels. International Union of Basic and Clinical Pharmacology. Ahuja SK, Ozçelik T, Milatovitch A, Francke U, Murphy PM (1992). "Molecular evolution of the human interleukin-8 receptor gene cluster". Nat. Genet. 2 (1): 31–6. doi:10.1038/ng0992-31. PMID 1303245. Lee J, Horuk R, Rice GC, Bennett GL, Camerato T, Wood WI (1992). "Characterization of two high affinity human interleukin-8 receptors". J. Biol. Chem. 267 (23): 16283–7. PMID 1379593. Morris SW, Nelson N, Valentine MB, Shapiro DN, Look AT, Kozlosky CJ, Beckmann MP, Cerretti DP (1992). "Assignment of the genes encoding human interleukin-8 receptor types 1 and 2 and an interleukin-8 receptor pseudogene to chromosome 2q35". Genomics. 14 (3): 685–91. doi:10.1016/S0888-7543(05)80169-7. PMID 1427896. Holmes WE, Lee J, Kuang WJ, Rice GC, Wood WI (1991). "Structure and functional expression of a human interleukin-8 receptor". Science. 253 (5025): 1278–80. doi:10.1126/science.1840701. PMID 1840701. Chuntharapai A, Lee J, Hébert CA, Kim KJ (1994). "Monoclonal antibodies detect different distribution patterns of IL-8 receptor A and IL-8 receptor B on human peripheral blood leukocytes". J. Immunol. 153 (12): 5682–8. PMID 7527448. Chuntharapai A, Kim KJ (1995). "Regulation of the expression of IL-8 receptor A/B by IL-8: possible functions of each receptor". J. Immunol. 155 (5): 2587–94. PMID 7650389. Morohashi H, Miyawaki T, Nomura H, Kuno K, Murakami S, Matsushima K, Mukaida N (1995). "Expression of both types of human interleukin-8 receptors on mature neutrophils, monocytes, and natural killer cells". J. Leukoc. Biol. 57 (1): 180–7. PMID 7829970. Schönbeck U, Brandt E, Petersen F, Flad HD, Loppnow H (1995). "IL-8 specifically binds to endothelial but not to smooth muscle cells". J. Immunol. 154 (5): 2375–83. PMID 7868904. Ahuja SK, Shetty A, Tiffany HL, Murphy PM (1994). "Comparison of the genomic organization and promoter function for human interleukin-8 receptors A and B". J. Biol. Chem. 269 (42): 26381–9. PMID 7929358. Sprenger H, Lloyd AR, Meyer RG, Johnston JA, Kelvin DJ (1994). "Genomic structure, characterization, and identification of the promoter of the human IL-8 receptor A gene". J. Immunol. 153 (6): 2524–32. PMID 8077663. Schnitzel W, Monschein U, Besemer J (1994). "Monomer-dimer equilibria of interleukin-8 and neutrophil-activating peptide 2. Evidence for IL-8 binding as a dimer and oligomer to IL-8 receptor B". J. Leukoc. Biol. 55 (6): 763–70. PMID 8195702. Wu D, LaRosa GJ, Simon MI (1993). "G protein-coupled signal transduction pathways for interleukin-8". Science. 261 (5117): 101–3. doi:10.1126/science.8316840. PMID 8316840. Sebok K, Woodside D, al-Aoukaty A, Ho AD, Gluck S, Maghazachi AA (1993). "IL-8 induces the locomotion of human IL-2-activated natural killer cells. Involvement of a guanine nucleotide binding (Go) protein". J. Immunol. 150 (4): 1524–34. PMID 8381837. Cerretti DP, Kozlosky CJ, Vanden Bos T, Nelson N, Gearing DP, Beckmann MP (1993). "Molecular characterization of receptors for human interleukin-8, GRO/melanoma growth-stimulatory activity and neutrophil activating peptide-2". Mol. Immunol. 30 (4): 359–67. doi:10.1016/0161-5890(93)90065-J. PMID 8384312. Mollereau C, Muscatelli F, Mattei MG, Vassart G, Parmentier M (1993). "The high-affinity interleukin 8 receptor gene (IL8RA) maps to the 2q33-q36 region of the human genome: cloning of a pseudogene (IL8RBP) for the low-affinity receptor". Genomics. 16 (1): 248–51. doi:10.1006/geno.1993.1167. PMID 8486366. Lloyd A, Modi W, Sprenger H, Cevario S, Oppenheim J, Kelvin D (1993). "Assignment of genes for interleukin-8 receptors (IL8R) A and B to human chromosome band 2q35". Cytogenet. Cell Genet. 63 (4): 238–40. doi:10.1159/000133541. PMID 8500355. Damaj BB, McColl SR, Mahana W, Crouch MF, Naccache PH (1996). "Physical association of Gi2alpha with interleukin-8 receptors". J. Biol. Chem. 271 (22): 12783–9. doi:10.1074/jbc.271.22.12783. PMID 8662698. Ahuja SK, Murphy PM (1996). "The CXC chemokines growth-regulated oncogene (GRO) alpha, GRObeta, GROgamma, neutrophil-activating peptide-2, and epithelial cell-derived neutrophil-activating peptide-78 are potent agonists for the type B, but not the type A, human interleukin-8 receptor". J. Biol. Chem. 271 (34): 20545–50. doi:10.1074/jbc.271.34.20545. PMID 8702798. Damaj BB, McColl SR, Neote K, Songqing N, Ogborn KT, Hébert CA, Naccache PH (1996). "Identification of G-protein binding sites of the human interleukin-8 receptors by functional mapping of the intracellular loops". FASEB J. 10 (12): 1426–34. PMID 8903513. Jerva LF, Sullivan G, Lolis E (1997). "Functional and receptor binding characterization of recombinant murine macrophage inflammatory protein 2: sequence analysis and mutagenesis identify receptor binding epitopes". Protein Sci. 6 (8): 1643–52. doi:10.1002/pro.5560060805. PMC 2143775 . PMID 9260277.